Enjoy beautiful views of June Lake from the private balcony of your vacation condo. 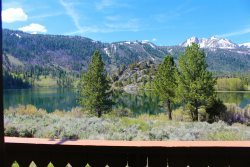 Book this condo as a base camp for exploring all of the area surrounding June Lake Loop. Only 2 minute walk to the marina. When looking for the perfect vacation in the Eastern Sierra, look no further than June Lake. This easy going village is tucked between stunning mountains and high alpine lakes. Once called the “Switzerland of California”, June Lake offers something for everybody each of four seasons. Book this vacation condo rental as a base-camp for your exploration of June Lake. June Lake stays timeless in its gorgeous location which attracts generation after generation. Many come to fish in the turquoise lakes with the plentiful trout varieties. Others enjoy a quiet walk through the golden leaves of the fall, a hike through untouched mountains, or a relaxing ski getaway. June Lake offers it all along with being close to Yosemite National Park, Devils Postpile National Monument, and world class skiing at Mammoth Mountain. To enjoy every pleasure June Lake offers stay at Sierra Suns. This June Lake condo is centrally located in the village with walking distance to shopping, restaurants, marinas and June Lake Brewing. From the back deck you view June Lake and is only a mile from June Lake Ski Resort. This cozy condo is waiting for you and your next adventure. "Our family has stayed in these condos for years for our annual fishing trip. We'll return for years to come." Very friendly and organized. I received verbal and written directions to the unit and it was really easy to find it. Very satisfied. This was our second time renting from June Lake accommodations and as the first time everything was perfect. Perfect for our needs and reasonably priced. We loved staying at the June lake property, it was very clean and had all the amenities needed for a comfortable stay. This trip to the Loop is our 44th consecutive Trout Opener. We go to fish, we do not fret about frills however we do like nice and clean properties. We rent different properties thru you according to the amount of people who join us, so we have rented pretty much all of these properties over the course of 35+ years. We stayed in Sierra Sun 11 and it was great. Big, clean, and perfect for our group of 5 and some company who came over for dinner twice. The property was big and clean. We liked the two bedrooms and 2 bathrooms + a loft. The view of the lake was nice. all my calls were handled well. Beautiful! Great location and condo was nice! Friendly, warm, inviting, personable, helpful. We were concerned as a family of 7 that squeezing into this condo might be exactly that, - squeeze. It wasn't. It was spacious and laid out well enough that everyone has their own space. It worked very well for us as a family! Excellent vacation stay. Check-in check-out could not have been any easier. Excellent family vacation retreat. Lots of room to spread out. Great proximity to lake, restaraunts, brewery. We loved the place! The team members were very friendly. I will definitely will return to June Lake and rent this property again. I like that the rental condo provided many amenities. We enjoyed our stay at Sierra Sun #11 and will most likely return in the future. The staff at the property management office were friendly and offered great customer service. MANAGERS RESPONSE Thank you for your kinds words. Hope to see you back soon! Please call (760) 648-1919 the day of traveling to make arrangements if you will be arriving after 5pm.